Edited By Barry King, Annie Goldson (themed) and David Robie (unthemed) This new edition features the work of film and documentary makers Alister Barry, Annie Goldson, Anne Keala Kelly, Jim Marbrook, Tom Morton, Joshua Oppenheimer, Max Stahl, Kim Webby and others. Unthemed art... read full description below. This new edition features the work of film and documentary makers Alister Barry, Annie Goldson, Anne Keala Kelly, Jim Marbrook, Tom Morton, Joshua Oppenheimer, Max Stahl, Kim Webby and others. Unthemed articles include "a sense of place" in Indigenous reporting, changing death coverage in The New Zealand Herald and tweeting, friending and reporting for media academic staff. 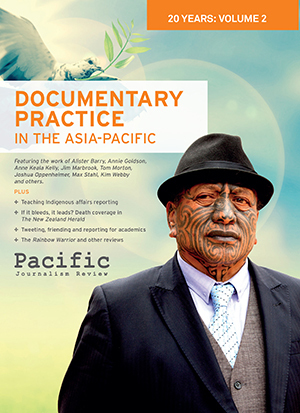 Founded at the University of Papua New Guinea in 1994, this peer-reviewed research journal explores journalism, media issues, communication and diversity in the South Pacific, Asia-Pacific, Australia and New Zealand. It is published by the Pacific Media Centre, School of Communication Studies, AUT University, and has links with the Australian Centre for Independent Journalism and the University of the South Pacific.